I discovered this old picture on the net, it is Mass here five years or so ago, when we had no sanctuary floor for a couple of months. 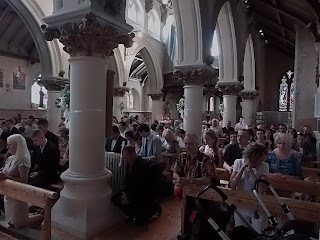 Because of lack of space the only possibility was to push the altar as far back as possible, even then there was only a couple of meters between the front pew and the chasm that was the sanctuary, 'ad orientem' was the only possibility for Mass. Before that we had used the so called 'Benedictine arrangement', which really is odd, with a small altar especially, people criticised it as "the priest hidden behind bars [candlesticks]", it seems odd to me to have a crucifix for the priest in front of him, with the corpus facing him and one behind him facing the people (two different Christs), which do you incense? In a big church like Westminster Cathedral, as improved as the present arrangement might be, but where the sheer size of the building renders the priests anonymous, it always seem strange to see only the priests torso and head behind the altar, rather than a whole priest in front of the altar. It such a huge building it seems a little comic, it is not after all as if one might see his facial expressions, even his voice is a little out of sync with his his lip movements, if you can see them. 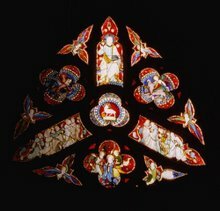 At the same time there was a study group in the parish who read Ratzinger's Spirit of the Liturgy and Michael Lang's Turning towards the Lord, about the same time I attended a conference of about a hundred priests, at which Archbishop Di Noia spoke and the consensus was that the liturgy and consequently the life of the whole Church would benefit by a return of ad orientem worship. When eventually we restored the church and there was a sanctuary floor the altar was designed for Mass to be celebrate both ways, initially I celebrated all the Masses, except in the Old Rite facing the people but it was they, certainly the servers, and those involved in the liturgy who urged facing east. I left it up to them and the sacristy staff to decide, I would celebrate Mass in either direction but found that generally it was arranged ad orientem. There was no serious outcry, for most people it just seemed natural, even now visitors might tell me my preaching is shocking, or complain about the absence of guitars or rhythmic beat in our music but rarely, if ever, about the orientation of our worship. Our bishop at the time expressed some concern in one his friendly letters but when I cited a letter from the CDW, with its protocol number, which pointed out that the choice of orientation was entirely up to the priest I heard no more about it. During the last days of Benedict there was a rumour that the CDW were preparing a document, perhaps even a new edition of the Missal that would promote ad orientem celebration. With the recent remarks of Cardinal Sarah regarding foot-washing and calling for ad orientem worship it seems that work still continues and awaits better times. 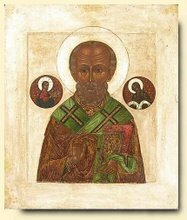 There is a nice little piece on the Christian significance of the East by St John of Damascus, which Fr Henry has posted. As Ratzinger points out whether we actually face East in our worship or not, we should at least be orientated towards the spiritual East: the Cross and the direction of the Resurrection and the Second Coming. It is part of the "poorer Church for the poor", the recognition that "gold and silver have we none but in the Name of Jesus ...". For me it is the recognition that I have little to offer but Christ has everything. That it doesn't matter if I am happy, a good communicator, wise or stupid, etc. all that matters is I offer Christ in his sacraments. 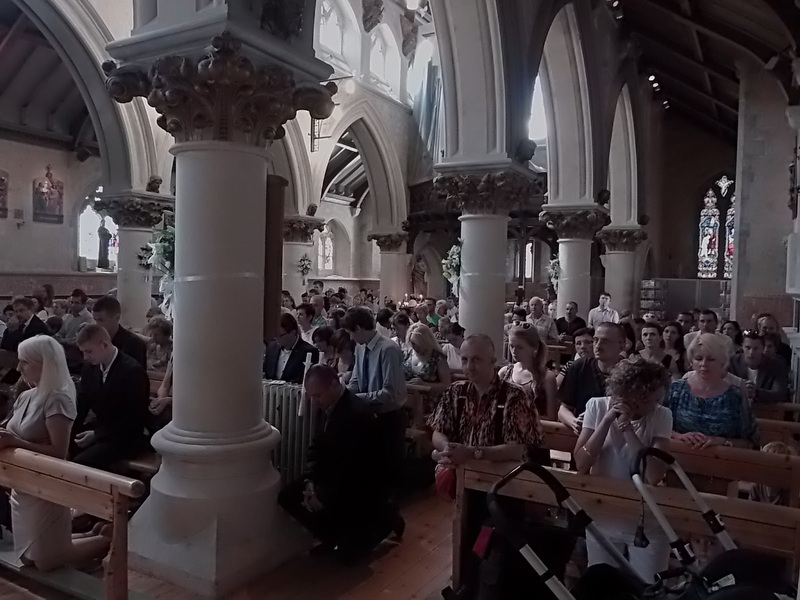 It seems entirely natural after a short homily to say, "... and so let us turn to the Lord". I rather bore my penitents by saying the most important thing to remember is that you are not the Lord: Jesus alone is Lord. all we can do is rely on Him, and turn to Him in our need and point to Him, if we take attempt to take His place it is beyond us, we will become neurotic, frustrated and are doomed to fail, all we can do is turn to him in faith, hope and trust. Most Mondays I celebrate Mass with a group of religious sisters who run a home for girls here in Bacolod City, Philippines. Most Sunday I celebrate Mass with the Sisters and the girls. 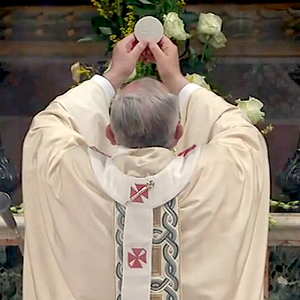 About three years ago I introduced the idea of celebrating Mass ad orientem, explaining what it means. As it happens the Sisters' small chapel is ad orientem, though the altar is a moveable wooden one. Since then the Sisters have almost always prepared the altar for an ad orientem celebration of the Monday Mass. 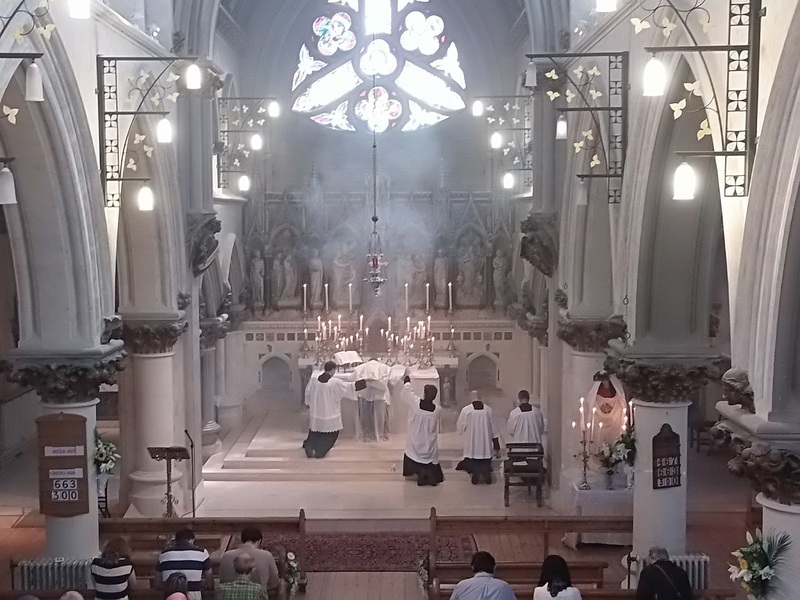 They usually prepare it for a versus populum Mass on Sundays, though I recently suggested that once a month we celebrate the Sunday Mass ad orientem. I really agree we need to always trust Jesus not ourselves - I've taken recently to saying 'Jesus I trust in You' as it makes us Christocentric and teaches me to rely on Christ. And at what cost all the "re-ordering", kneeler salvaging and all the rest? My own cathedral appears not to have an altar, but a "worship space", the same designed to accommodate large con-celebrations and Chrism Masses-with The Blessed Sacrament in a side-altar with little, if any, scope for prayer before the same. Which appears to be replicated throughout the UK and USA.